The Eagles officially have the biggest album of all time, 407 feet to be exact! 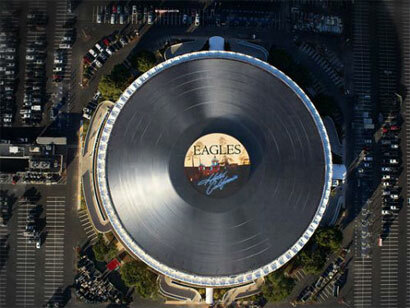 A huge ‘Hotel California’ vinyl record has been created to be placed on top of the refurbished Forum venue in Los Angeles. The huge scale album (pictured below) contains 250,000 square feet of vinyl, it weighs 25 tons, contains 15,000 LEDs and 5000 nuts and bolts. The record will rotate on the roof of the Forum at 17mph and will be seen daily by thousands of visitors to Los Angeles as they fly into LAX airport. The letters themselves are as big as those in the iconic Hollywood sign. Depending on weekly sales, the Eagles’ Greatest Hits is either no.1 or no. 2 on the biggest selling albums of all-time list for the USA. The album has sold 29 million copies in the states and alternates with Michael Jackson’s ‘Thriller’ album for the top spot.